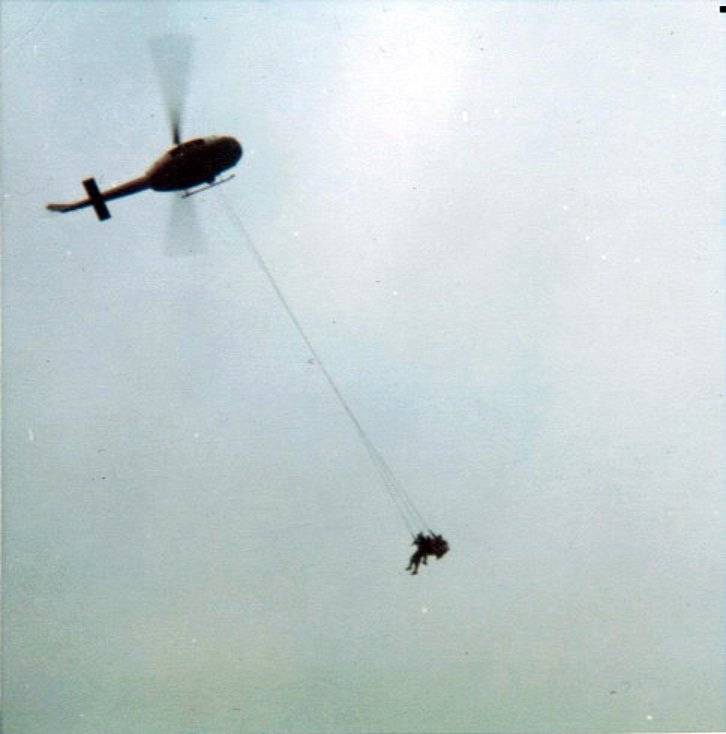 The ‘McGuire rig’ was used quite frequently to extract soldiers from the jungle when no suitable pick-up zone was available. I served with the Co, G 75th Rangers in Vietnam (Americal Div.) 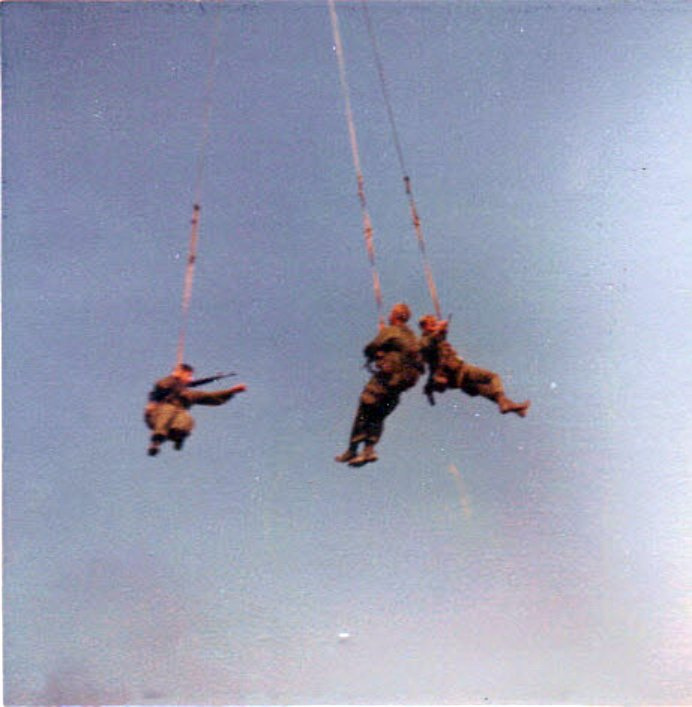 and had the experience of being extracted from LRRP missions on several ocassions by McQuire rig. Got to admit, it scared me to death every time. Its a very dangerous method of pulling a team out, especially at night and during a hot extraction. Enemy tracer rounds come flying up at you like basketballs. 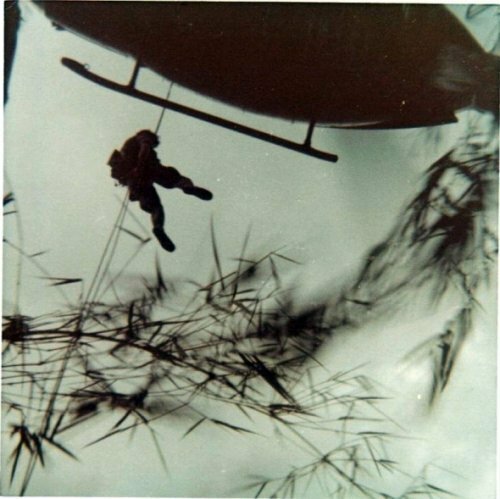 Our company had several Rangers die during one of these extraction due to being dragged thru the tree tops. Thanks for your reply, buddy. Some say it’s youth, some don’t know what it is, but. My friends and I never thought about anything else other than how to get the troopers out when asked to do so, day or night, wx be damned. It’s my greatest achievement in life to have been a combat helicopter pilot serving troopers in combat. Most of the men who lived to tell about it know this. War is hell. There’s a reason that phrase was coined. The troopers in the sand box today are demonstrating the most historic examples of bravery and self sacrifice by serving 7 up to 12 tours in the Middle East and Africa. The men and women who fight our nation’s battles are heroes! Moreso because they have the poorest level of leadership from this Commander in Chief, President Obama. He is a coward. He is a traitor to the spirit of the American fighting Man!. Nothin’ more to say except maybe, Airborne! The McGuire Rig was one the simplest and most effective devices ever invented for pulling troops our of triple-canopy jungle. Strangely, you felt totally safe and secure just sitting in the thing, flying along at perhaps 2,500 feet. Oddly, I came close to getting killed in one when one of our VNAF H-34 pilots got too low while approaching the drop-off point on the runway up at our Kham Duc training center, oblivious to the fact that he was dragging me down the side of the runway at about fifty knots and heading straight for a parked jeep alongside the runway. I finally managed to kick myself off to one side, missing the jeep by inches. I never found out which of the VNAF pilots nearly did me in – nobody wanted to own up to it.